Countdown to Avengers: Infinity War continues, but since neither me nor Dad could find our D.V.D. for The Incredible Hulk, we decided to skip that one first and head on to what has been described as one of the Marvel Cinematic Universe's most inferior entries, and a letdown of a follow-up to the film that started it all. The defendant has been accused of having a very needlessly complicated plot, while also having no focus at all in developing both old and new characters, all in an attempt to make way for the bigger universe. So help us God, we will get to the bottom of this. Welcome back to Dateline Movies, and movie court is now in business for the case of Dateline v. Iron Man 2! Also ... ahem (in Samuel L. Jackson' voice) ... "mister, or miss, or missis Reader, I'm gonna have to ask you to exit this blog post" ... ahem ... because spoilers are coming your way! With his heroic identity made public knowledge, Tony Stark, played by Downey Jr. (Soapdish), is being hounded by the government for his technology's potential to become weapons in the hands of various other supervillains. One of those attempting to replicate Stark's Iron Man technology is the incompetent weapons developer and Stark's corporate rival Justin Hammer, played by Rockwell (Galaxy Quest). Tony's personal life is even made more complicated when the Arc Reactor, the very device that is designed to keep him alive, is also poisoning his bloodstream, and will soon kill him. His uncontrollable fear of death strains his relationships with his closest friends Pepper Potts, played by Paltrow (Great Expectations), and James "Rhodey" Rhodes, played by Cheadle (Ocean's Eleven), forcing S.H.I.E.L.D. director Nick Fury, played by Jackson (Changing Lanes) to send one of his top agents, Agent Natasha Romanoff, played by Johansson (the live-action version of Ghost in the Shell), to spy on him. But when a villainous genius named Ivan Vanko, played by Rourke (The Wrestler) threatens to tarnish Tony's legacy with his own version of the Arc Reactor, Tony must get a grip and save the world once more from those who seek to use his inventions for nefarious purposes. The cast is as game as ever, especially the latest addition that is Sam Rockwell. 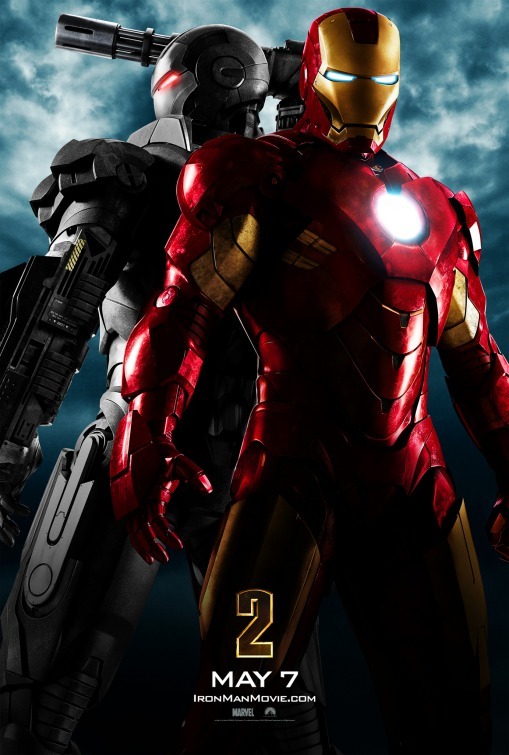 At first, I thought Iron Man 2 is a more or less okay enough of a sequel, but on second viewing, I can really see why a lot, and I mean, a lot of fans would say that this sequel is really not as superior as its predecessor. Looking back on my most recent viewing of the film, I just realized that the only reason why I was mildly pleased with the flick was because of the cast's performances. No seriously, their performances are actually the only thing that is keeping this film from reaching DC Extended Universe levels of unwatchable. Of course, we all know that Robert Downey Jr. is the living, breathing manifestation of the Armored Avenger, but for me, it somewhat felt like his performance was undermined by the very confused film script, but we will get to that later. Downey Jr. obviously did everything he can and he just went with it, from eating donuts on a giant donut, to peeing his pants on his own alcohol-filled birthday party, but at least his chemistry with Don Cheadle and Gwyneth Paltrow is really good. Personally, I think the best scene showcasing Downey Jr. and Cheadle's acting is during the climactic battle, wherein both Iron Man and War Machine debate on who should be "the big gun". It is a simple and funny exchange that highlighted the two characters' brotherly bond. I would also mention the battle between Tony and Rhodey during his birthday party, but it really did not have that "my friendship is on the line" type of tension. But of all of the performances, from Downey Jr.'s committed performance, to Cheadle's much livelier approach to Rhodey, to Paltrow's ever charming portrayal of Pepper Potts, I think the one that truly stood out for me was Sam Rockwell's hugely underrated performance as the bad guy wannabe Justin Hammer. It really is funny that Sam Rockwell came "this" close to donning the Iron Man suit before Downey Jr. came, and seeing him here, being the overly child-like, overly pretentious, overly spoiled "anti Tony Stark" is casting at its finest. I do believe that Rockwell deserves way more credit for his role here, because among all of the villains in the M.C.U., he is the one of the only few actors who managed to give his character a distinguishable personality. Kudos also for Rockwell's impeccable comedic timing. That scene wherein he asks his butler Jack, played by food stylist Jack White in his only on-screen role, to test and see if the Hammeroid's head was indeed a helmet is just comedy gold. Also, I think people overlook the efforts Mickey Rourke, the guy who wowed audiences everywhere with his performance in Darren Aronofsky's The Wrestler, for playing Whiplash. His scenes, while unbelievably cartoonish, have some shades of commitment. There are scenes that show that Ivan Vanko is more than just the vengeful fiend, but a tormented soul, much like Killmonger, played by Michael B. Jordan (Fruitvale Station) from Black Panther. I have read some articles saying that he wanted to do some additional scenes to flesh-out his character much more, only for them to end-up on the cutting room floor, which is very tragic, considering that Rourke might have been trying to make his character more than just a one-dimensional baddie. You did your best, Mister Rourke. Allow me to make it clear to everyone, all the way to the back, that the Justin Theroux's script is all over the place. Thanks in no small part to the M.C.U. 's once antagonizing sickness that is "corporate meddling". There are a lot of things that could have been great in this film, but they all ultimately end up falling head first to the ground. One of the most common pieces of criticism that I have read about this film is that it tends to try and establish the shared universe concept that we know is already taking its course, and yes, those claims are correct. This claim is clear as day through the unnecessary appearances of Scarlett Johansson's Black Widow, and Samuel L. Jackson's Nick Fury. Neither of these mentioned characters have made significant developments in the film, and while Black Widow had one standout fight scene against the Hammer Industries security personnel, Nick Fury's appearance can pretty much be scrapped, and the movie itself would not be different. And because of these forced inclusions, one cannot help the feeling that the characters that really matter to the film's narrative as watching as their respective story arcs are dragged and beaten to a pulp. This goes even for Tony Stark himself, because the last time we saw him, we see him taking Ho Yinsen's, played by Shaun Toub (Stretch) advise on not wasting his life, only for him basically do that instead of saving the world. Arguably the biggest developmental casualty here is Whiplash's, because let us face it, he is clearly not in the same league as any of these villains: Loki, played by Tom Hiddleston (Midnight in Paris), Helmut Zemo, played by Daniel Brühl (Eva), Ego, played by Kurt Russell (Big Trouble in Little China), The Vulture, played by Michael Keaton (Beetlejuice), Hela, played by Cate Blanchett (Carol), and obviously, Killmonger. He is just pretty much your run-of-the-mill guy out for revenge. Sadly, that is all to say about his character. Heck, even Pepper Potts and James Rhodes have almost nothing to do but worry about Tony's self-destructive behavior. Shout-out to Jon Favreau though for having some of the film's more fun scenes, and his comedic side-by-side fight with Black Widow is quite a delight. Despite being cool visually, the action is really underwhelming, which is a shocker. The first Iron Man had a lot of fun action sequences that are enough to balance out the character developing moments, including Tony's escape from his captors, Tony's rescue of a village, Tony's escape from a couple of military fighter jets, and Tony's final battle with the previous film's main antagonist. Iron Man 2, on the other hand, is surprisingly lacking in the action front, which is actually pretty strange for a superhero movie. If you have watched this movie, there are only a total of three short, and somewhat underwhelming, stakes-free action sequences, including the one in the race track, the one with Rhodey taking the template for the War Machine armor, and the final battle against Whiplash. While none of them are actually just as fun or thrilling as what the first film showed, these three short fight scenes are still worth your while, but these three key scenes really did not compensate for the more dialogue-heavy scenes. The first fight with Whiplash is actually pretty awesome, especially his cool entrance, with the scene made even more entertaining thanks to some surprisingly hilarious, if albeit uneven, moments with Jon Favreau's Happy Hogan and Gwyneth Paltrow's Pepper Potts. Up to this day, my sister and I still find the truth that Whiplash manages to survive getting hit by a car multiple times as still strangely funny. (Thanks Screen Junkies for making it even more humorous.) But sadly, it was very, very short, and you barely even get to see Iron Man in action during this scene. Also, while the use of C.G.I. strips the realism that was established in the first film, which is the reason as to why I felt little stakes during the battle scenes, the designs of both Iron Man and War Machine's remain as lively as ever, although I do find Whiplash's suit sort-of uninspired. While it makes sense for Obadiah Stane, played by Jeff Bridges (Hell or High Water), to sport an all-black knockoff suit in the first film, I expected the new suit to be ... different, and not just be another black knockoff suit, but with electric whips. And yeah, the villain has a short schedule, but could he not have at least done a better paint job? Since the character is based on Crimson Dynamo, should he not have crimson paint on his suit? The film tries, and fails, to juggle two major story arcs at the same time. And this is where the film ultimately derails, right at the very beginning when they all thought that juggling two nearly distinct story arcs was a good idea. At the beginning of the movie, audiences were lead to believe that it is about Tony Stark's coming to terms with the inevitability of death, but then in the next scene, it is all about Tony Stark having to deal with the fact that people all over the world might be trying to replicate his work, but then later on, it is about one man's thinly sketched revenge plan against Tony Stark, but then much later, it is all about Tony Stark potentially becoming an Avenger, which we all know was a foregone conclusion to begin with. Come on, he is Iron Man, one of the founding members of the team. The two arcs that I am referring to are 1.) Tony's coming demise, and his attempts to do the best that he can to leave a worthwhile legacy, and 2.) Tony's father, Howard Stark's, played by John Slattery (Mad Men) secret formula for a new element, and how the sins of his father lead to the main antagonist's downward spiral to villainy. As much as I am a hypocrite to this advise, but you cannot have it both ways. Iron Man 2 could have been so much better if the script stuck to only one of these main story arcs, and still have the liberty to introduce Black Widow to mainstream audience. You can also feel how rushed the conclusion was, when an element that is impossible to synthesize is synthesized in a montage. If they were to take route one, which is the "legacy" arc, the first thing I would write in the script is to not have Tony Stark spend the entire movie acting like he does not have a heroic responsibility to do. Instead, I think the movie should have just taken the route of adapting one of the core basis for this film, which is Armor Wars, wherein Iron Man is on a race against time to retrieve his stolen blueprints, and to mix that up with the Arc Reactor subplot, Tony just wants to retrieve the blueprint for the new element. Justin Hammer, in turn, can be made much more developed here, as he will be revealed to be the mastermind behind the theft through Whiplash, who sold it to other bad guys, and the film can then pretty much follow the film from there, minus all of the boring stuff. If they were to take route two, my favorite, which is the "new element" arc, they should make Whiplash also dying of the exact same sickness that Tony is experiencing, and instead of sharing with him, he decides to make one for himself, and make another to destroy Iron Man and everything that he holds dear, which in turn makes Whiplash a much more formidable villain. In addition, they can just make his attacks on Stark Industries mysterious, so as to keep the stakes high, while Tony should remain almost unaware of his father's secret documents's existence, which Whiplash is aware of. While not the worst entry in the franchise, and while not without its redeeming factors, Iron Man 2 is sadly a victim of too much dangling plot threads, and way too little character developments. And that is it for our official movie review for Iron Man 2. Considering that we are becoming a tad bit stricter in our reviews, I might as well re-evaluate some of our past reviewed films, including Justice League, because last time, I might have been a tad bit soft on it the first time. We still have a lot more movies to cover, so be sure to stick around for the first movie in the God of Thunder's rollercoaster of a trilogy. Before you leave, listen to three of the featured AC/DC songs from this film, considering that the music, and John Debney's work, did help a bit with the flick. Fun fact: Dad and I won the album version of the soundtrack. Stay tuned for more Dateline Movies!